Healthcare training plays a vital role today, and there are many ways of achieving this, but as technology advances, there is a need to take advantage of what is available. Online healthcare training has come on in leaps and bounds recently and obviously, this brings in many opportunities to advance this with new technology. VR has already been used in areas such as Dementia Training for allowing carers to understand this illness better and we are looking at now bring VR to the surgery training spectrum. This all really started for me way back when I was in high school and I was originally interested in video game development and around that time there was some illness in my family and it got me interested that maybe there’s a way to use software and technology which I was so passionate about to help people specifically with medical problems. Then in college, I was studying biomedical engineering and my mentor had some pretty sage advice for me and he suggested that if I wanted to invent technology, that it’s best to understand the problems. So he thought the best way to do that in medicine was to be a physician. I followed his advice and I went to medical school at UCLA and then I stayed there to pursue my orthopaedic surgery training and subsequently also some specialized training in pediatric orthopaedics at Boston Children’s Hospital and it was during my training that I really discovered the biggest problem I feel is facing our healthcare system today. That’s how we train educate and assess our providers. It was experiencing this problem and seeing it every day that led me to basically combine my passion for game development to try and solve this problem with virtual reality. So then I thought, well what would you say is the most challenging aspect of the traditional training that we do with our doctors and surgical teams. What is it that is lacking that could improve the patient experience? There are many challenges and it really depends on who you are and where you’re at in your career. If you’re talking about residents and training, the issue that they have is that there is just too much to learn and too little time to learn it, so it’s kind of basic math really. If you think about it every year, we are discovering new science, new medicine, new procedures and new technologies and devices and these, in general, are not replacing something but adding on, so added additional things we need to know and not only are there more procedures that we need to learn now but these new products tend to be more complicated. If you think about it there are things like robotic surgery or image-guided navigation patient-specific implants, maybe people have heard of some of these things but whereas we used to be able to learn these new techniques that meant a few surgeries on patients, now these new techniques have data that sometimes you have to do it more than a hundred times on people before you can do it safely and up until then it’s much riskier, and in addition to that, there’s much less time to learn. With residents, there were work hour restrictions imposed which were quite reasonable but now I’m a researcher – working only 80 hours a week and that lost a year of training time. Certain administrative tasks like electronic medical record system have shown up to now take up over 50% of residents and other physicians time. Then there are cultural changes where people are now much more aware of who is operating on them, who are touching them when they’re in the hospital or the clinic and they’re less inclined for obvious reasons to have people practising on them for the first time. For most of us the term virtual reality is pretty self-explanatory, but for those of us who aren’t familiar or intimately familiar with the term, what is virtual reality or VR as it’s commonly referred to? I think that’s a great question and I think the term itself has changed over the years but virtual reality in today’s day and age really refers to an immersive kind of interactive media experience in which the user will wear a handset so that looks almost like ski goggles that you put on your head and in front of you are special lenses for your eyes and then a screen, and within the headset are motion sensors and also some sort of tracking system to track the position and rotation of your head. Once you put this headset on you are looking into a virtual world that feels like you’re actually there, and this is called a sense of presence. Wherever you look and wherever you move you will move within that virtual world and it’s almost indistinguishable from the real thing. Additionally, VR can have what’s called motion control so high quality via or tether VR will have one to one hand tracking so you can interact with the virtual world. 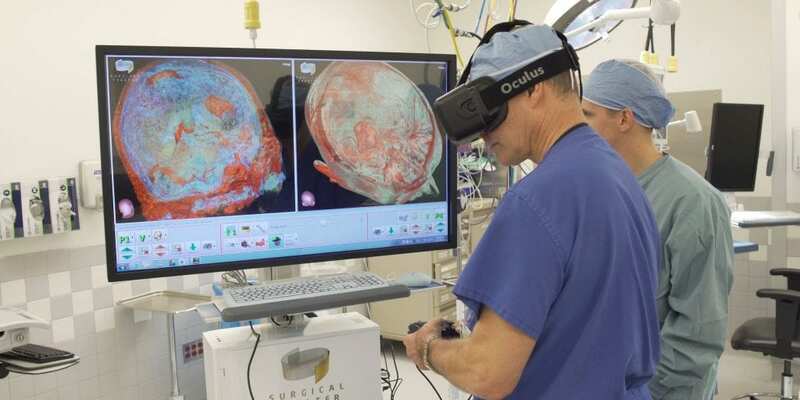 With your hands, you can pick up objects for surgical simulation and can perform the procedure like hammering filling incisions and things like this so this is a critical component of modern VR that really enhances the immersiveness and interactivity. There’s also the multiplayer aspect of it where many doctors or surgical teams are able to log into a program and are able to train virtually no matter where they are on the planet. We recently announced our collaborative training functionality so we’ve had up to 15 people in our virtual reality training experiences and they’ve been all over the world, so we’ve had people from the east coast of the west coast USA, from the UK and other places, all in virtual reality training together and it’s really fun and exciting and very intuitive and natural. This allows you to do is you can learn with teams without people having to travel or find time to get together in the same physical location and you can also capture expertise so you can have a world-renowned experts who live very far away able to train you personally in these very advanced techniques and you can bring this incredible knowledge set to very remote and rural areas that may not have had access to advanced surgical training in education and assessment before. Another important aspect to team training that is a benefit of simulation within healthcare recently is what is called soft skills of leadership communication general workflow and efficiency and these are so critical for patient safety and this team training really gives you the ability to not only train but also evaluate teams and how they perform. As you can see, the opportunities for VR in the healthcare market are boundless and we are very excited with the opportunities that VR represents worldwide.